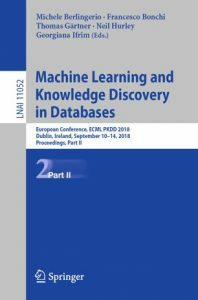 The European Conference on Machine Learning and Principles and Practice of Knowledge Discovery in Databases took place in the Croke Park Conference Centre, Dublin, Ireland during the 10 – 14 September 2018. This event is the premier European machine learning and data mining conference and builds upon over 16 years of successful events and conferences held across Europe. Ireland was delighted to host and to bring together participants to Croke Park- one of the iconic sporting venues but also providing a world-class conference facility. ECMLPKDD 2018 Proceedings are now available at Springer Online. Click icons below to access.